Prince Caspian is out on video and I'm reading through The Chronicles of Narnia. 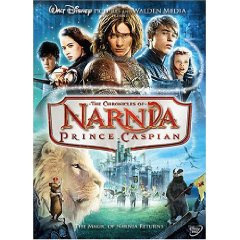 I'm thinking next week is going to be all about Narnia around here so stay tuned for quotes, thoughts, reviews and more! I have not seen the new Prince Caspian yet, I love the old BBC production though and have high hopes for this new Disney film! Maybe I'll get it for Christmas! I haven't seen Prince Caspian yet. Hoping to get it soon. Re: Inkspell. I know what you mean about Meggie. Dustfinger is who keeps me going. Can't wait to see what happens to him. Your blog was the first place I saw the C.S. Lewis quote, "You can't get a cup of tea big enough or a book long enough to suit me," (roughly paraphrased). I always remember it, and maybe it's one reason I liked you so much.